With Callum Overton pulling on a Pagham shirt for the first time since December, things looked to be on the up for the Lions as the game began. 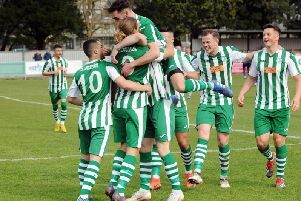 This mood lasted for a full 34 seconds before Lewis Hole, Little Common’s top scorer, collected a ball over the top of a static Pagham defence and rammed it past Luke Terry to give his relegation-haunted side the lead. The Lions did finally break out of their half in the 12th minute but Overton’s goalbound shot flicked off goalie Cruttwell’s leg and was hacked clear just short of the goal-line. Pagham were soon back on the defensive again but could not stop Hole notching his second in the 15th minute as he back-headed the ball past Terry to put the Common two up. Sixteen minutes later it was 3-0 to the home side when Sam Ellis drove the ball a full 30 yards through a jumble of legs and into the net. Overton did his best to get Pagham back into the game before half-time when he had one shot drift over the bar and another well saved low down by Cruttwell. But it was not to be, and a dejected Lions side trooped off at half-time with their heads low. The second half started with the Lions much the brighter side, but it only lasted until the 56th minute, when Jamie Crone beat his man on the left and shot low and hard across Terry into the net. 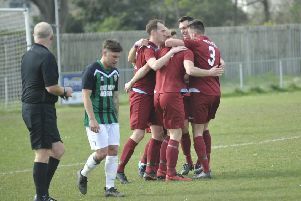 It left a huge mountain for Pagham to climb, but they tried hard and got their reward after 65 minutes when Overton pulled one back from the penalty spot, having been hacked down in the box following a mazy run from the halfway line. But that was as good as it got for the Lions, as despite yet more effort the ball just would not drop for them in the box and the referee blew his whistle to end another miserable afternoon for the club. Pagham; Terry, Wiggans, Wollers (Hubbard), Selby, Hands, Horncastle, Bingham, Hambleton (Ashmore), Neighbour, Overton, Brady.